The Romantix: Historical Romance Author - Grace Elliot - More to her than meets the eye!! Historical Romance Author - Grace Elliot - More to her than meets the eye!! Today, I would like to introduce everyone to Grace Elliot, a fellow Solstice Publishing author. Grace's debut novel, A Dead Man's Debt is beautifully written, and a good, fast-paced historical love story (if I say so myself). Ranulf Charing is perfect for this era and setting. Charming, yet brooding, I found myself drawn to him and his selfless personality. Celeste Armitage is delightfully head strong, and her moments of confusion made me smile. The scene in the card room between Celeste and one Violet Farthingale made me chuckle. Ms Elliot has created a wonderful, vibrant world, which easily drew me in and kept me hooked from the first page. Ranulf and Celeste’s relationship grows steadily and strongly, pulling me along for the historical ride. Unfortunately, the nasty Ursula Black, who is well named, plans to throw a spanner in the works for the lovers. Celeste Armitage has a plan…and that plan doesn’t include marriage. Nothing is as it seems. Lord Ranulf’s life is a façade. Only he can save the Charing’s from disgrace as a blackmailer tries to ruin his late brother’s reputation. But just as Ranulf dares to open his heart to Celeste, the fury of his nemesis is unleashed… facing him with the stark choice between true love and family duty. However when Celeste guesses the truth behind his rejection, Ranulf underestimates her resolve to clear his name and in so doing places the woman he loves in mortal danger…. Welcome to The Romantix blog, Grace. Tell us a bit about your latest full-length release, A Dead Man's Debt. Hi there, and Kiss, I’d like to say how much I enjoyed In the Shadows of Angels – the first download on my ‘virgin’ kindle, I read it in two sittings – couldn’t put it down! I hope my book A Dead Man’s Debt will give readers such pleasure! Awwww thanks Grace. I've read A Dead Man's Debt and I know it will give readers much pleasure! 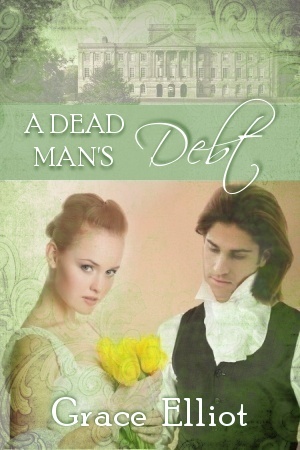 A Dead Man's Debt is my debut novel, a sensuous regency romance about blackmail, duty and unexpected love. I write the sort of books I like to read, filled with sexual tension, delicious historical detail and driven by a gripping plot. I have written 5 novels, but A Dead Man’s Debt is the first to be sent to a publisher. My short stories and non fiction has been widely published in the UK in magazines such as The People’s Friend, the Lady, Writing Magazine and My Weekly. Tell us a little bit about the characters in A Dead Man’s Debt. Oh I’m totally in love with the hero, the darkly restless Lord Ranulf Charing. As eldest son he carries the weight of the Cadnum’s reputation when all he wants is to be an artist. Dutiful but frustrated, his life is a façade. Only when he meets the heroine, the unconventional Celeste Armitage, and witnesses her courage, does he dare to lay bare his heart…to a woman who has sworn never marry. Give us a little insight into the way you write your books. Do you have any rituals you do before you write? Writing is an addiction. I have to write or I get scratchy and irritable. Generally I write for at least 20 minutes a day, rain or shine…inevitably this extends to fill whatever time is available, at the expense of house work, meals and other wifely duties! My writing spot is a sofa in the dining room, with one of my five cats pressed against my leg. Initially I work to a story outline, drafted from start to finish before I write the first word. I also decide what the hero and heroine look like and their character traits before the serious writing begins. Then I write for myself which means letting the words pour out onto the screen without caring about grammar, or even complete sentences. This shows up flaws in the original outline and areas that need to be explored and deepened and hey presto, the book has taken on a life of its own as the characters tell their own story. How did the premise for this book come about? Truly the whole idea came out of one name...Celeste. It’s an unusual name that I came across in a novel, and I wondered what sort of woman my Celeste would be. It seemed she had ethereal ideas, not pinned down by society, strong and intelligent. A woman like Celeste wants to see the world and travel, not be shackled in marriage…so what would happen if she was pushed into doing exactly what she abhors... of course she rebels! But what if she fell in love with the sort of man she most despises... and slowly, A Dead Man’s Debt was born. Do you only write historical romance? Could there be any stories outside your genre down the track? My absolute passion is history and my next book is also a regency romance. If I were to be unfaithful to the regency period, it would be with the Victorian era, also a great love of mine. What genre do you like to read? Who’s your favourite author? Oh Kiss, were to start? Firstly I’m a bookaholic and read everything from the classics to film spin offs. But without doubt my favorite genre to lose myself in is historical romance and my fave authors are the likes of Stephanie Laurens, Mary Balogh, Lisa Kleypas and Gaelen Foley. What’s next in the world of writing and publishing for Grace Elliot? My next book is in its third draft and should be finished in New Year 2011. I continue to publish short stories in the UK and currently have a series of non fiction articles about pets appearing in a veterinary journal. Or at the Amazon Kindle bookshop. So be it. Ranulf gritted his teeth as he grasped the leading leg and pushed. It was like fighting against a brick wall, the calf barely moving. A lamb was difficult enough, how much more so a calf? Just as he was wondering if one man was strong enough, a shower of pebbles rattled down the bank. Concentrating on the calf, he barked. “I beg your pardon!” A woman‟s voice answered. With a flash of annoyance Ranulf glanced upward. A contraction clamped around his arm as the cow's tail switched across his face, stinging his eyes like a cat-o-nine-tails. In a flurry of muslin and lace the Miss slid down the bank, landing with a thud in the ditch. “Ouch.” She rubbed her ankle. Ranulf glared back, dark eyes flashing. Pulling a face she limped over. Ranulf's eye lingered for she merited a second glance. Of middle height with a tidy waist and curves where God intended them, she appeared quick witted and bright eyed. Without further ado, she stripped off her gloves throwing them onto a bramble bush. Long, sensitive fingers grasped the muddy tail. Practical, Ranulf thought, silently impressed. “There wasn't time.” Her bonnet slipped backwards, revealing a quirky face with a pointed chin, her lips finely drawn with an arched cupid's bow. The sort of face an artist could lose himself in, all shades of the sea to be found in deep emerald eyes framed by a tangle of chestnut hair. Ranulf tightened his grasp and pushed. Sweat beading his brow. The calf retreated an inch. “What are you doing?” Her voice was gentle and calm, if somewhat deep for a woman. Ranulf guessed it would be husky in bed, whispering over a pillow after a night of passion. Her eyes were on him - deep green eyes, lively and entrancing. Suddenly he remembered that he was undressed to the waist, her curious gaze on his skin as he was gripped by the idea of those lily white hands gliding over his naked chest, her almond shaped nails digging into his skin. He shook away the thought, trying to remember her question. All innocence and interest she watched, blushing faintly in a charming way and yet, he realized, no wilting flower. He shook his head. The woman had asked a question, damn it. He would answer. “The calf is breech.” He grunted, “I need to push her back into the womb to turn her…” He wanted to shock this stranger, to test how bold she truly was. She stared back, biting her top lip, exaggerating her snub nose. “Ah!” Her gaze met his. Throwing him an angry look, she anchored the tail with a log and scrambled round to the beast's head. After a moment‟s thought, she placed her pelisse under the cow's head stroking the broad nose and crooning words of comfort. “She's relaxing.” Ranulf's arm was numb from the contractions. He fell forward, as the first leg finally slid back into the womb. "That helps." His hair had come free from the ribbon, falling thickly about his shoulders. He glanced at the Miss. She was leaning forward, her bosom straining against a tight bodice, a satisfying cleavage between her breasts. He swallowed hard. She was odd looking, he decided, not exactly beautiful but eye catching none the less. Her face showed character, determination…and her complexion too healthy to be fashionable, rosy cheeked and peppered with freckles which with a hint of sunlight burst into a profusion. The Miss was glaring at him now, her skin glowing bright pink. Had he been staring? His heart raced as he returned to the calving. Thank you so much, Grace, for taking the time to tell us a little about your book, and your writing process. We wish you the best of luck with A Dead Man's Debt.